1. PREHEAT THE OVEN TO 375F Break the almond paste into small pieces and combine it with the sugar in the bowl of an electric mixer. 2. Mix on low speed until very fine. Add egg whites in 4 additions, mixing about 1 minute between each. 3. Beat the paste until very smooth, about 2-to-3 minutes. 4. Fill a pastry bag fitted with a 1/2-inch plain tube with the mixture. 5. Line 2 cookie sheets or jelly roll pans with parchment paper. 6. Pipe the mixture on the paper in 1-to-1 1/2-inch mounds, about 1-inch apart. 7. Fold a clean kitchen towel into a long strip and moisten the towel with water. 8. Squeeze lightly to eliminate excess water, leaving the towel more than damp. 9. Slap the surface of the Amaretti gently with the towel to moisten them and make the surface smooth. 10. Sprinkle the Amaretti with granulated sugar. Bake about 15-to-20 minutes, until they are well risen, a deep golden color, and their surface is covered with tiny cracks. 11. Remove from the oven and place the pans on racks to cool. 12. To remove the Amaretti from the papers, turn the papers over with the Amaretti still adhering to them and wet the papers with hot water, using a brush. 13. Leave a few minutes, then pull on the papers to release the Amaretti. 14. HERE ARE 2 VARIATIONS OF AMARETTI: Amaretti di Pinoli: After moistening the piped Amaretti, strew them with pine nuts, sprinkling them on heavily, then pressing lightly with the fingertips so that the pine nuts adhere. 15. Do not dust with sugar. Bake as for the Amaretti. 16. Fior di Mandorla: This variation of Amaretti is popular in Southern Italy and Sicily, where the mixture is sometimes colored green or pink during the mixing. 17. Their rough, craggy appearance is a nice contrast to the smoothness of the standard Amaretti. 18. Prepare the Amaretti, up to, and including, moistening them with the towel. 19. Dust heavily with confectioners' sugar and allow the piped mixture to dry at room temperature, uncovered, at least 12 hours, or overnight. 20. After they have dried, indent each of the piped mounds with the thumb, first and middle fingers of one hand, positioning them equidistant around the circumference, and pinching gently inward, about half way into the center. 21. Bake the Fior di Mandorla at 375F, about 15-to-20 minutes. 22. 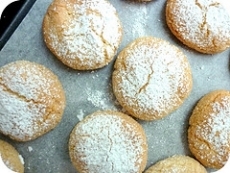 Cool and loosen the Fior di Mandorla as for the Amaretti.